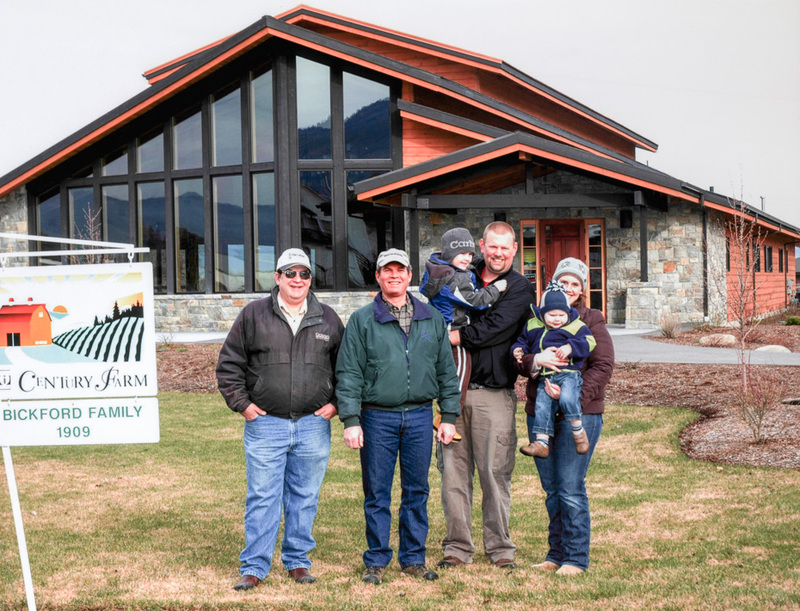 Bickford Orchards-- Van Horn Vineyard and Century Farm: Family members Steve and Don Bickford are running the vineyard which produces wine under the label "Mt. Hood Winery." This photo was taken in front of their tasting room and event venue located on Van Horn drive in Pine Grove. In addition to the grapes grown for wines, they still habe 125 acres of Pears and have the distinction of having worked with Stadleman Fruit Packing for close to 60 years. left to right: Don Bickford, Steve Bickford, John Stehlik, (son-in-law), holding son, Jack; Merridy Bickford Stehlik, (daughter of Steve), holding son, Andrew. Congratulations for hanging in there through many years of change.